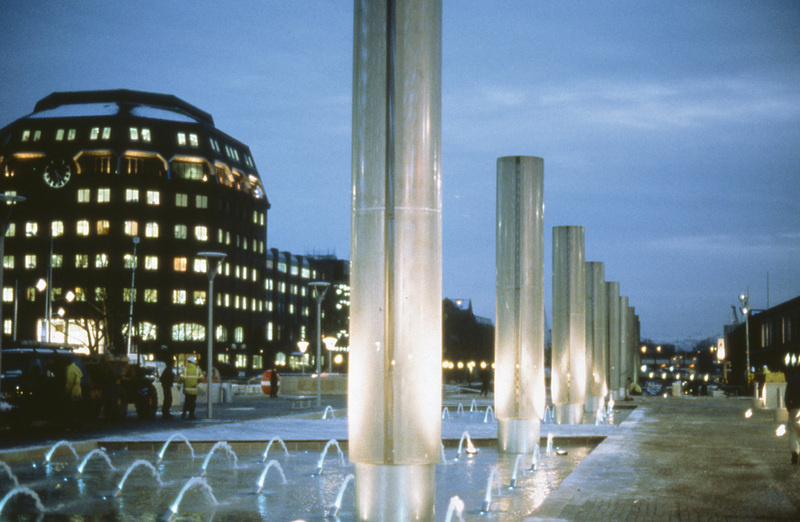 Ten tripartite perforated steel beacons set among fountains, commissioned by Bristol City Council as part of a £4m harbour-side regeneration project. 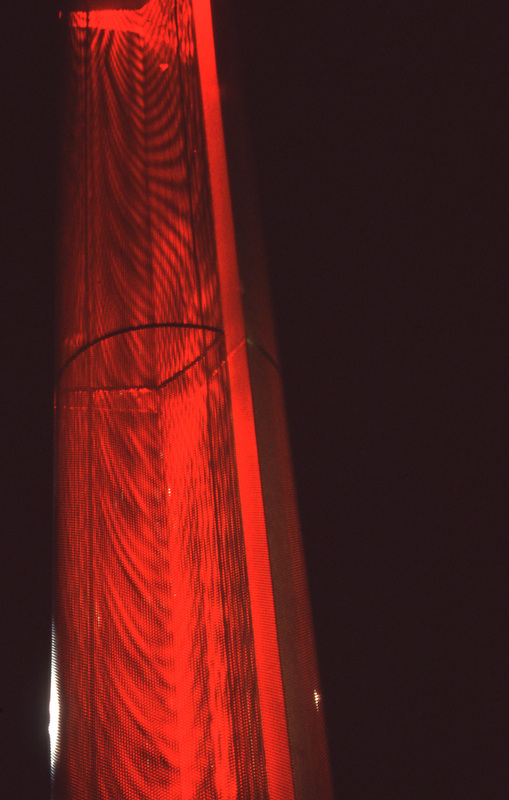 When lit internally, the beacons lose all materiality and become translucent bodies of light. Seven beacons stand 6m high, three stand 9m high. 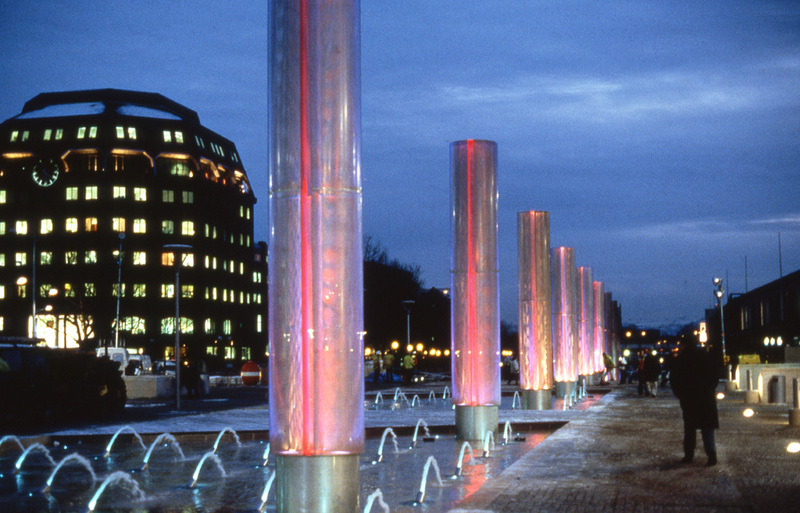 Each beacon has 10 luminaires addressing the inner and outer surfaces of the segments, and the fittings are individually programmed to create a wide range of appearances, moiré patterns and colour mixes. Manufacturer: John Vine, Jordan’s Fabrications Ltd.
Acknowledgments: Vaughan Thompson, Helen Carey. This commission was, again, a competitive interview, and our ideas for the beacons grew out of previous pieces including the Docklands roundabout piece, the virtual work proposed for the top of Brick lane and a work proposed for Plymouth Harbour. The idea of starting with a compass and using perforated steel, rather as a scrim is used in theatre, developed into the works in existence. There were a number of difficulties with the commissioned work, not least the budget being not commensurate with ours, and the City’s, ambition. 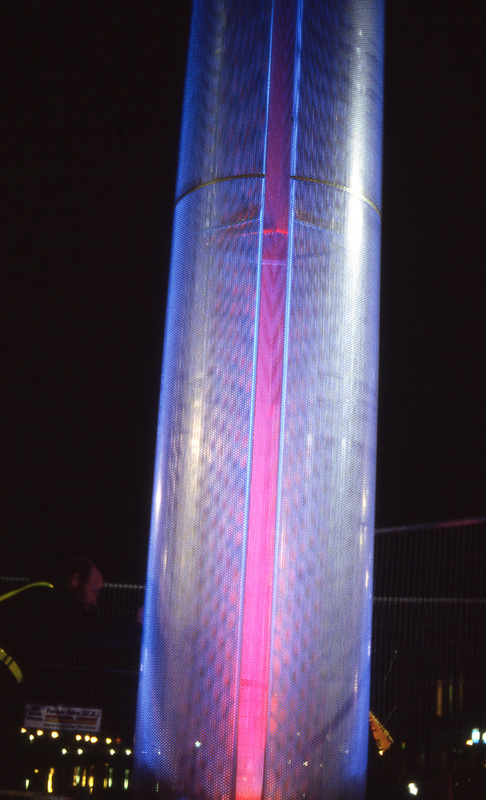 One interesting point to consider is that when choosing the construction of the beacons (approx a metre in diameter, 6 and 9 meters high) we were offered quotes ranging from £17,500 per beacon to something under £3,000 per beacon. I always felt that the handling of the commission was somewhat unfortunate. The architects and planners had already designed the future context for the beacons and the placing of them, without any consultation with the artists who were to produce the beacons. Something of a case of if you want to end up there, you don’t want to start from here. The works have been troubled by technical issues partially due to flooding by the fountains they are placed within and the process has dragged on for years. 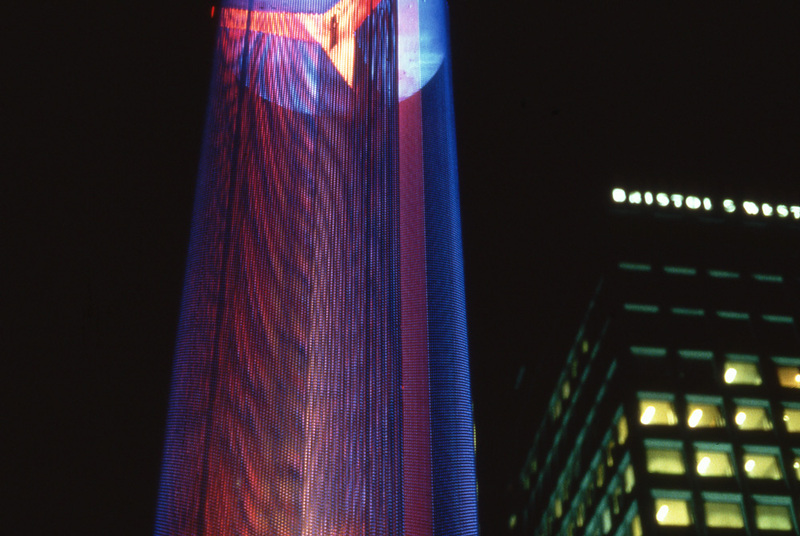 When properly working the cross-fading of luminaires revealing the interior, or glinting on the exterior, produces very seductive images involving moir interference patterns and rich plays of light and shadow. I have enjoyed the transitions from apparent solid materiality to the apparent floating immateriality of the structures so I have ended up thinking that they were successful structures aesthetically and conceptually but perhaps over ambitious for the context and budget.